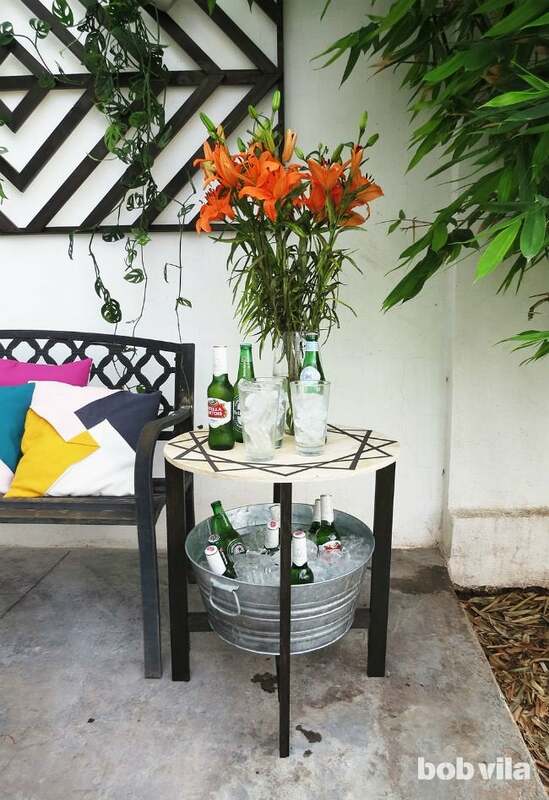 Beat the heat with an outdoor furniture that keeps your drinks on ice. Talk about refreshing! Has a relatively empty patio left you uninspired to head outdoors? When it comes to setting up the deck or balcony, you have a few important elements to consider to create as warm of a welcome as possible—ample and comfortable seating, some storage, lush greenery, and shade from the sun’s rays, for starters. 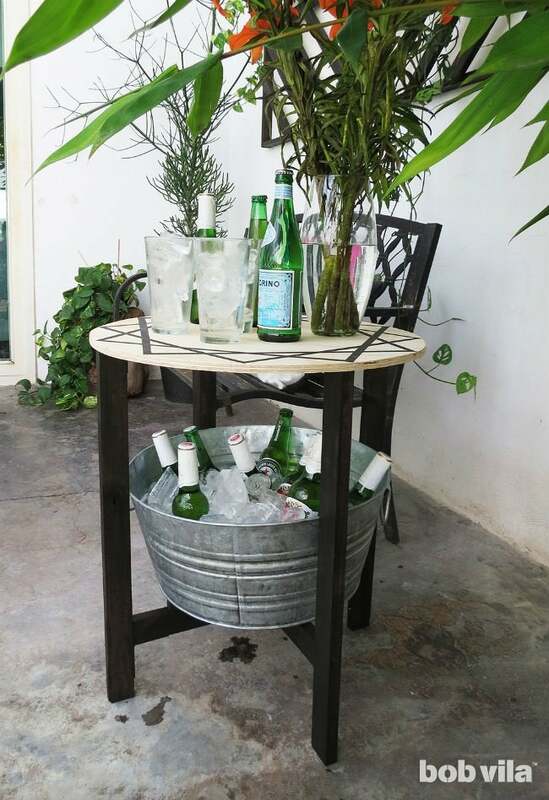 And if you don’t want to spend the evening going to and from the fridge for chilled beverages, don’t overlook this one al fresco essential: the cooler. Rather than settle for a plastic cooler that you feel compelled to hide in a corner to keep it from clashing with your modern style or farmhouse aesthetic, consider a more custom approach. You can build a patio cooler table that has double the function—an ice bath for refreshments and a place to rest drinks and small plates—all without being a damper on design. 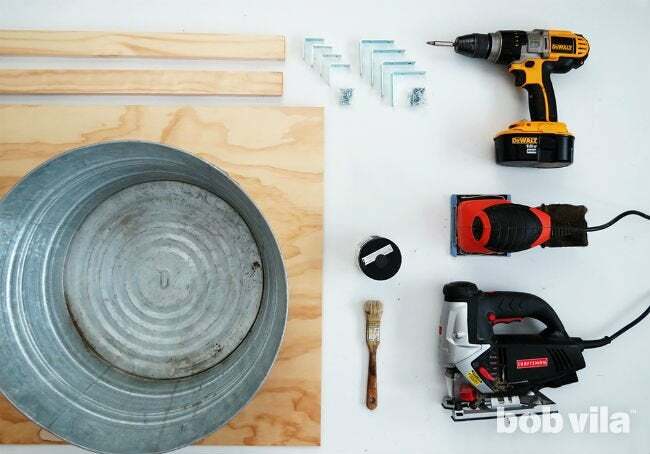 Get the step-by-step instructions for this do-it-yourself project below. NOTE: We use an 8″-deep bucket with a 17-inch diameter, but chances are you’ll be using one of a different size. No problem! 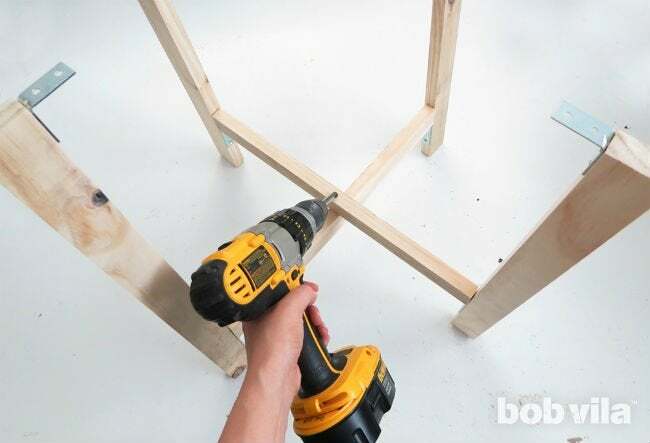 We’ll explain how to adapt the side table dimensions to fit whatever bucket you’ve chosen. These five inches account for the width of the table legs (you’ll have two which are two inches wide, one on either side) and an extra inch so that the table’s top extends out just a bit over the legs. In our case: 17 inches (the bucket’s diameter) + 5 inches = 22 inches (tabletop’s diameter). 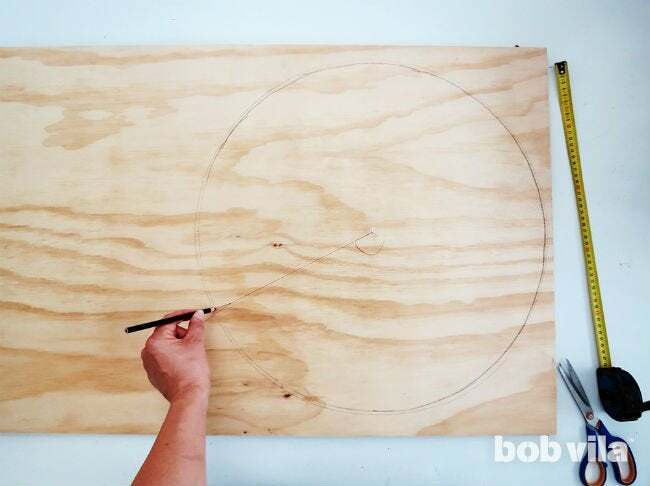 Trace a circle with the diameter you determined in Step 1 onto a plywood board. Tip: Stick a push pin into the board holding one end of a string. 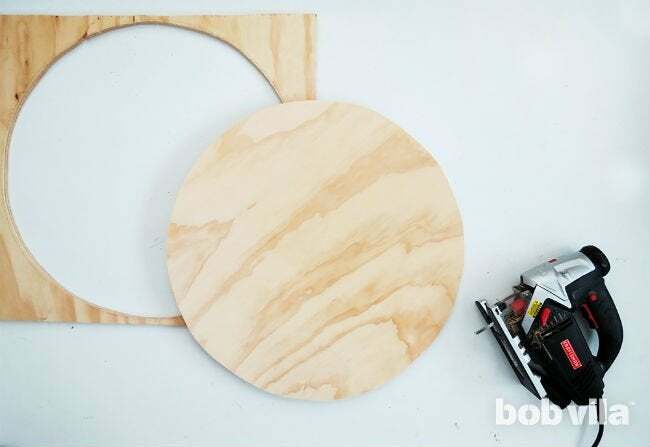 Cut the string that extends from the center to be a little longer than your table’s radius (half of the diameter you measured in Step 1). Knot the free end of the string around a pencil’s eraser; the distance between the pin and the pencil tip should now equal your round tabletop’s radius. Slowly draw a perfect circle by keeping the string taught and holding the pencil as straight as possible—keeping its lead point on the plywood—while you rotate the pencil around the pin. Use a jigsaw to cut out the traced circle. Sand the edges to remove splinters. Decorate the table’s top to your liking using paint, or even a stencil. Wait for the paint to dry completely and then brush on a protective coat of varnish. 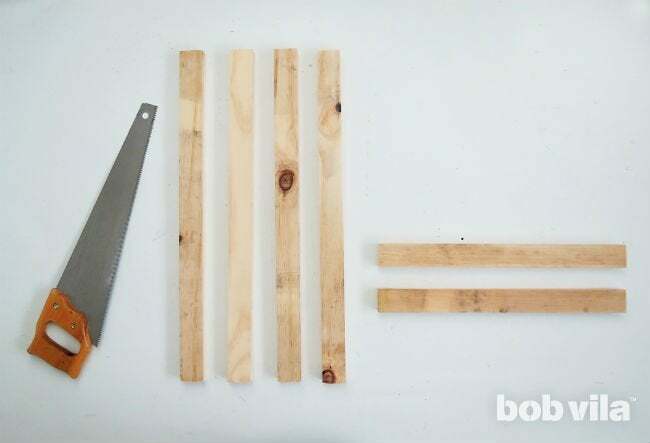 Cut your 1×2 lumber into four legs at the particular length you need. 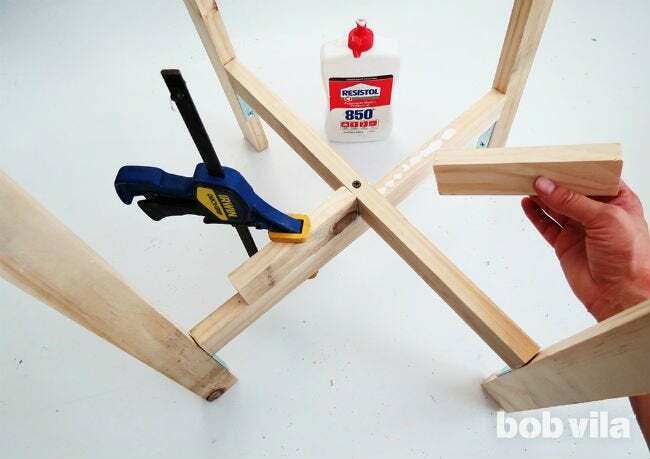 Build the 1×2 table legs to make two “H” shapes, which will support the bucket. Take two legs and attach a 3-inch corner brace into the narrower side of the 1×2 just four inches from the end (see photo). For extra strength, we first applying wood glue and then screwing through the brace into the wood. On the two other legs, fasten each 3-inch corner brace five and a half inches from an end. Pair the legs to match the corner brace locations. 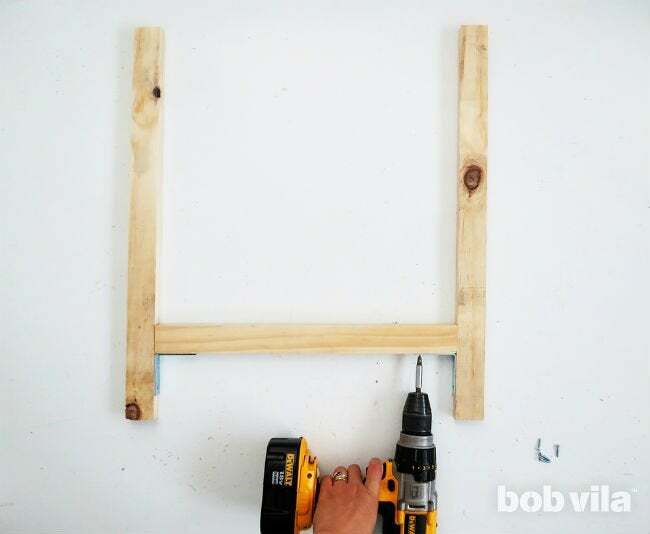 Then, join the two legs with corner braces four inches from the end by placing a short crossbar in between them along the exposed ends of the corner braces. 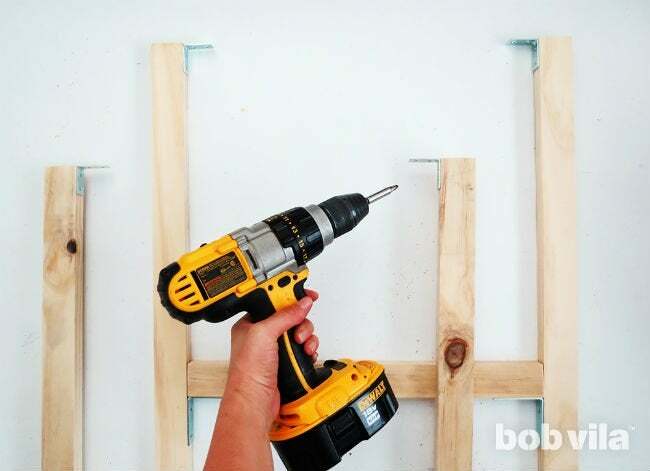 Apply wood glue to the underside of the crossbar, then screw through the exposed end of the corner brace into the crossbar (again, the narrower edge). 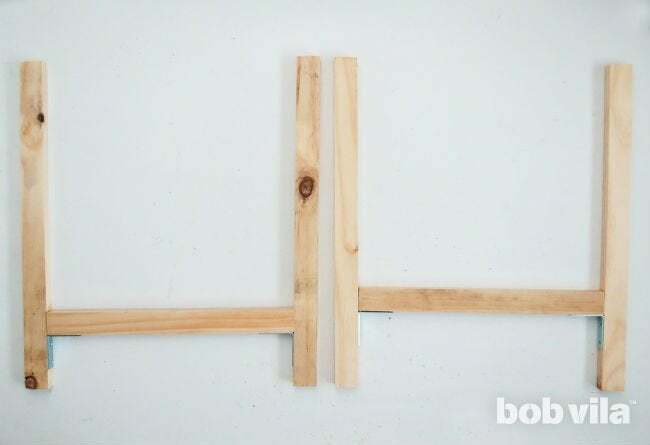 In the end, you’ll have an H-shaped wood structure. Repeat Step 6, this time with the remaining two legs, which should each have a corner brace placed five and a half inches from the end. To easily attach the round top that was cut in Step 3, screw a small corner brace flush with the top edge of each leg. Screw each on the narrow side of the 1×2, facing into the H shape. Now, stand the legs so that one “H” crosses over the other. Check that the crossbars are perfectly perpendicular, then put a little wood glue between them and screw through the middle to hold. 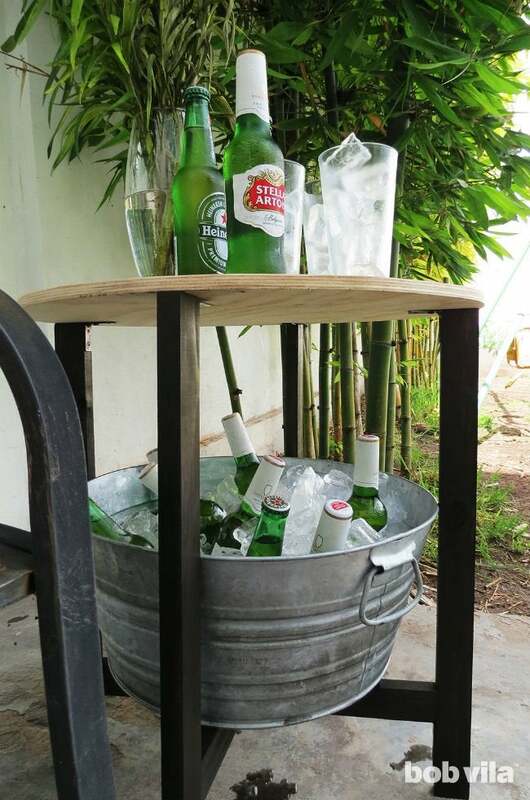 At the moment, the structure for your cooler table might appear a little flimsy, but don’t worry! 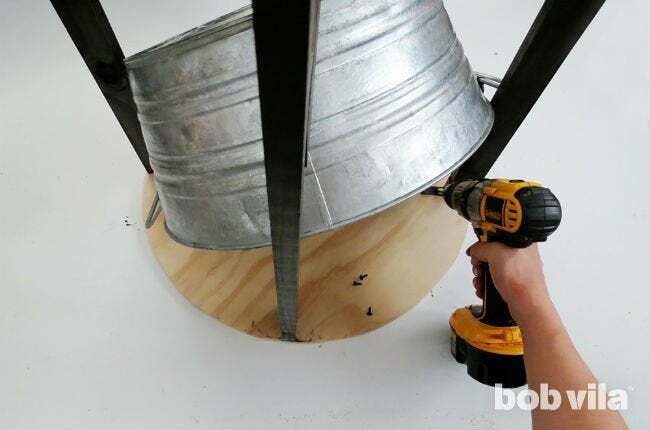 It will stiffen with the addition of the tabletop and bucket. Now, make an even surface at the crossbars for your bucket to rest on. 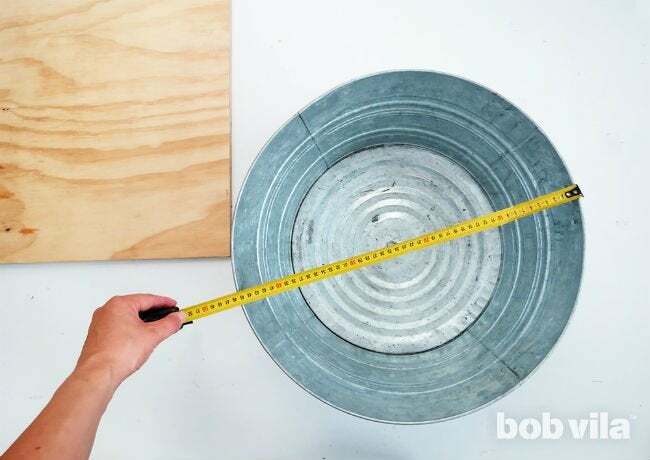 To do so, measure the diameter across the bottom of your bucket and cut a 1×2 to that length minus three-quarters of inch. Then cut that in half. Sand all of the edges, then glue each of these fresh cuts onto the lower crossbar on either side of the higher one. 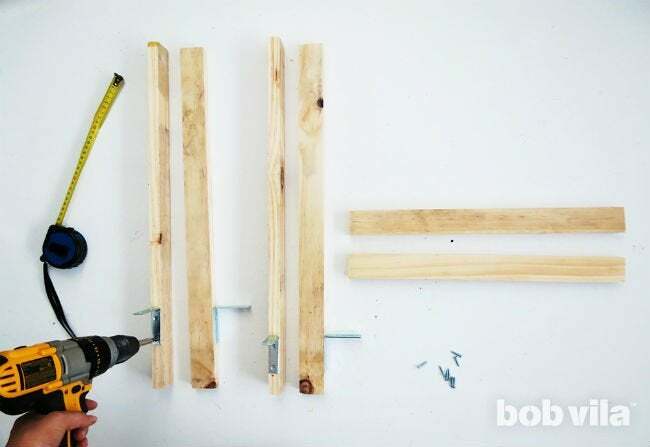 Hold the wood with clamps until the glue dries. 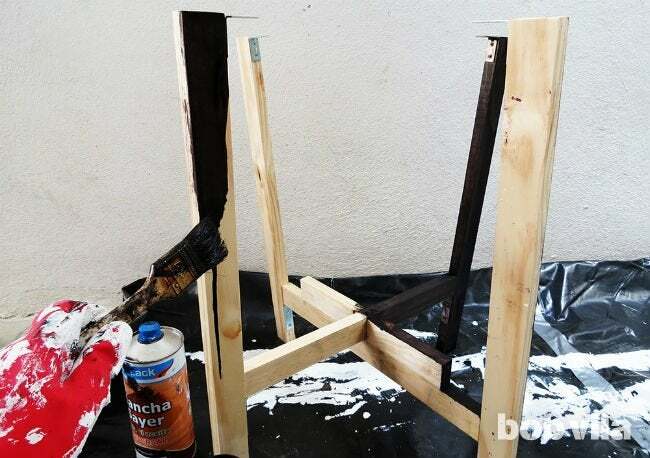 Stain or paint the table legs however you like! Two coats should do the trick. Then, cover that with two coats of varnish to protect the table from the elements and the condensation of chilled drinks. Now, flip the cooler table right side up, and lower the bucket to sit perfectly centered on the crossbars. We left it loose, because the legs should be a relatively snug fit and keep the bucket in place. All that’s left to do is add some ice and your favorite refreshments to the bucket! 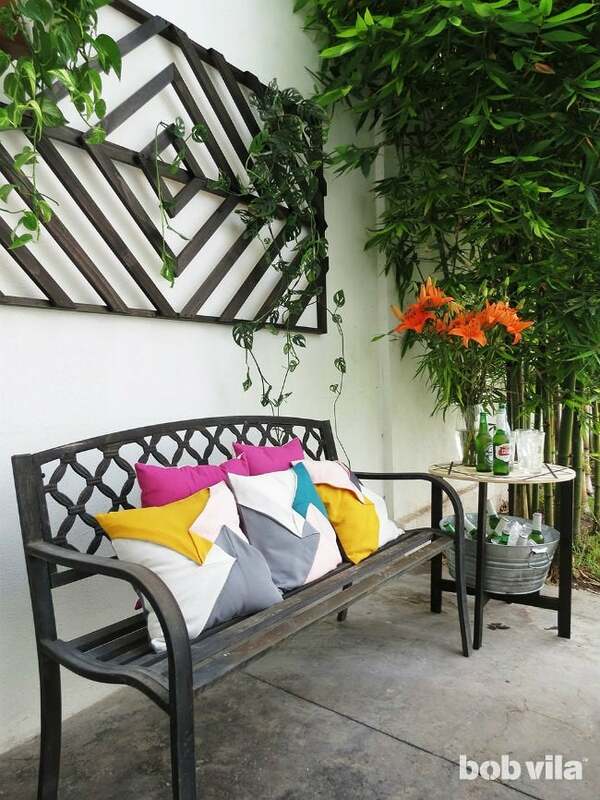 Love this DIY wall trellis? Check out that tutorial next to really complete the patio space.